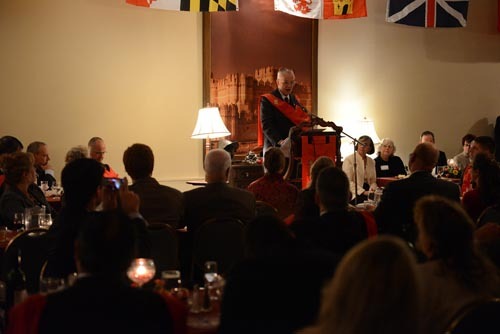 On the last weekend of October, more than 200 supporters, members and friends of the American Society for the Defense of Tradition, Family and Property (TFP) gathered for their annual national conference at the TFP headquarter in Spring Grove, Penn. 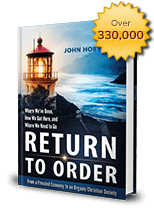 The theme of conference was “Return to Order: Returning America to Honor.” John Horvat’s new book, Return to Order: From a Frenzied Economy to an Organic Christian Society—Where We’ve Been, How We Got Here and Where We Need to Go, provided the topics for the many informative talks and presentations. A full day of talks began Saturday with opening remarks by Mr. Michael Drake describing the central theme of honor and the program for the conference. 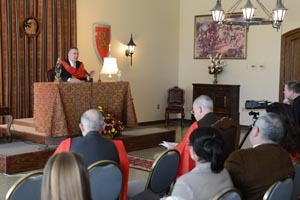 This was quickly followed by TFP Vice-President John Horvat II speaking of “Wisdom: the Foundation of an Organic Christian Society.” He began by describing how modern man is as if lost in a forest, immersed in all manner of technology, yet at the same time lacking wisdom to properly make use of it. 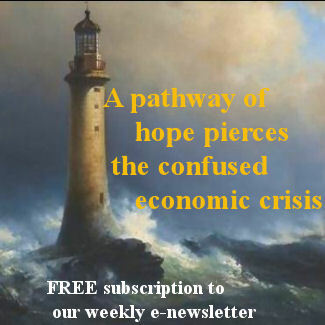 Wisdom is like a map that allows people “to know the highest cause of things.” What modern man needs most, Mr. Horvat concluded, is wisdom to discern how to deal with the present-day crisis. He then outlined three premises that reflected wisdom and are found in an organic Christian society. Author of Return to Order, Mr. John Horvat, giving the second talk. Following a hearty lunch, the participants were given a presentation by German TFP member Mr. Mattias von Gersdorff titled “Pop: The Culture of Intemperance.” He began by explaining the problem with modern man being carried away with the spirit of the times due to a lack of personality to conform one’s life to one’s convictions. He then traced the history of popular culture and the drastic changes brought on by the quickening pace of life under the Industrial Revolution. He concluded by highlighting the role of the media in spreading a dangerous culture that has led to global massification and nonstop exposure to bad influences. Mid-afternoon brought Mr. Robert Ritchie speaking on “Return to Order: Repercussions and Expectations.” He highlighted all the efforts that have been made by TFP members and supporters to promote the book, Return to Order and answered common objections. He then outlined new plans over the coming year to spread the ideas of the book and invited all to join in these efforts. The final talk of the day was given by Mr. Norman Fulkerson. “When Men Dream, Heaven is Closer.” It began with a definition of the dream as the desire all people have for a better and ideal world. This ideal world is a realistic and non-utopian evaluation of a possible world that motivates men to progress. He then described how the Revolution deviated the dream with the introduction of Romanticism. Mr. Fulkerson concluded by emphasizing how segments of the American public long for a true ideal, and what is being offered in Return to Order appeals to them because it is truly authentic, and there is a wind of the future in it. Sunday began with a presentation by Mr. Horvat called “Using the Map: Stories from Return to Order.” The talk by the book’s author focused on how to use the map of wisdom present in the book in a practical way. He gave five principles found in the book, a practical episode or example for each from daily life and then practical things that might be done to apply that principle. At the end he presented the need to enter upon the Way of the Cross, and how great sacrifice and suffering are needed to do anything worthwhile. He cited author Richard Sennett who claims that craftsman and other experts need at least ten thousand hours of training to become masters of their skills and how this long training is arduous like the Way of the Cross. Mr. Horvat applied this principle to the promotion of Return to Order and invited the audience to engage on a Way of the Cross of 10,000 hours of work now needed to advance the campaign to spread the book’s principles. 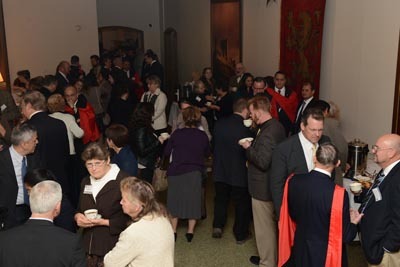 Refreshments are served and lively conversations ensue. Following a short break, Mr. James Bascom presented the talk “Examples from Organic Society.” He began by explaining how a Return to Order for our country will result in a society which is truly Christian, entirely organic, and authentically American. He then related nine principles which characterize organic society in contrast to what prevails today. The presentations came to a close with Mr. Michael Whitcraft speaking about “Role Models and How They Inspire Society.” The talk defined representative figures and bourdon souls, and he gave examples of role models already existing in America whose actions inspire men to heroism and virtue, contrasting with those promoted by the media who lead men to vice and immorality. A final exhortation encouraged audience members to seek out and be good role models as a means for transforming our society. 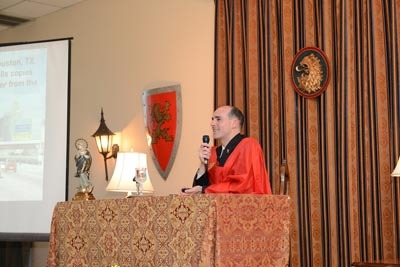 Bertrand of Orleans-Braganza, Prince Imperial of Brazil giving the final remarks during dinner. As has become a tradition for these conferences, final remarks during dinner were given by Bertrand of Orleans-Braganza, Prince Imperial of Brazil. Summing up the thoughts of the other presenters over the weekend, Prince Bertrand reiterated that the path to an organic Christian society in America will not be easy and seems impossible. In concluding, Prince Bertrand succinctly summed up the hopes of all present by quoting Prof. Plinio Corrêa de Oliveira in his seminal work Revolution and Counter-Revolution. “An enthusiastic standing ovation filled the banquet hall, and conversations continued long into the night. Strengthened from a full weekend of informative presentations, participants returned home ready to do their part for a Return to Order in America. This entry was posted in Featured and tagged America, beautiful, book signing, brutal pace of life, false happiness, Family, financial speculation, frenetic intemperance, honor, Institutions, leadership, marvelous, mechanical existence, Order, organic Christian society, Praise for Return to Order, tradition by John Horvat II. Bookmark the permalink.